Posted in: Media Release, Reward, Update, WANTED. Approximately 40 Franklin Police Officers assisted in the search for escaped prisoner Joseph Ray Perkins. We suspect that Perkins may have used the stolen Vulcan Materials truck to flee the Franklin area following his escape from custody early this morning. Our officers remain in close communication with partner agencies as the search for Perkins continues. If you spot Perkins, call 9-1-1. Posted in: Media Release, WANTED. Franklin Police are searching for a vehicle stolen from Vulcan Materials, 1001 Downs Boulevard, sometime during the overnight hours. 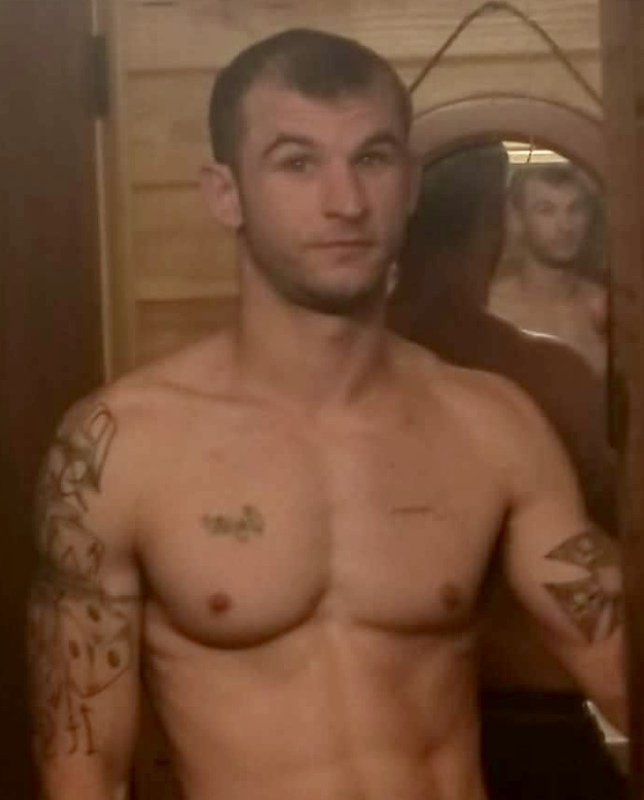 It is not currently known if the stolen vehicle is related to Joseph Perkins, the escapee being sought in Franklin. Posted in: Media Release, Update, WANTED. The search for Joseph Ray Perkins continues in Franklin this morning after he escaped from THP custody outside of the Williamson County Jail. Franklin Police, the Williamson County Sheriff’s Office, and Tennessee Highway Patrol are coordinating efforts to find Perkins, on the ground and in the air. Perkins is likely desperate, and area residents should avoid being outdoors if possible. Residents should ensure that their homes and vehicles are locked. Please do not leave an unattended vehicle running, or with keys or a gun inside. Perkins is a violent felon with a lengthy history. He is 6’2” and weighs 180 pounds. He was wearing a white t-shirt, gray shorts, and handcuffs. As we continue to search for Perkins, area residents are urged to be vigilant. If you see Perkins, call 9-1-1. At 1:18 am, Franklin Police were notified that a prisoner who was being walked into the Williamson County Jail had escaped. 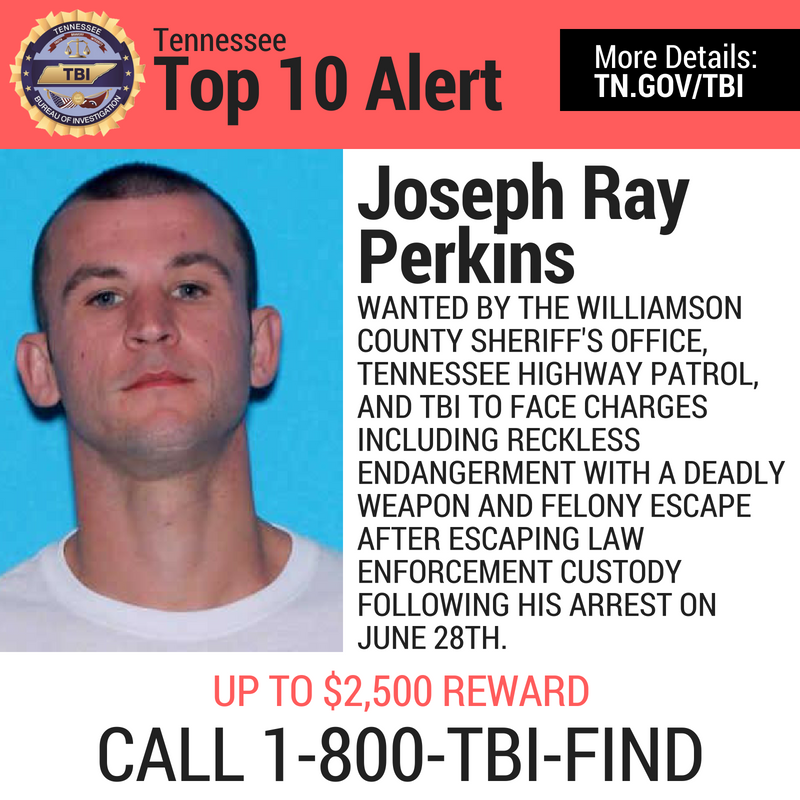 While a Tennessee Highway Patrol Trooper was preparing to take 31-year-old Joseph Ray Perkins into the Williamson County Jail, on Century Court in Franklin, Perkins emerged from the Trooper’s vehicle, assaulted the Trooper, and then fled on foot. The Trooper was uninjured, but Perkins, who had managed to slip his handcuffs from behind his back during transport, is currently at-large. Joseph Perkins, who was wanted in Alabama for First Degree Burglary, is a violent felon with a lengthy history. He is 6’2” and weighs 180 pounds. When Perkins escaped he was wearing a white t-shirt, gray shorts, tennis shoes, and handcuffs. His shoes have been found in a nearby rock quarry. It is highly likely that Perkins is still on foot in the area. As we continue to search for Perkins, area residents are urged to be vigilant as they head out this morning. Do not leave vehicles running or unlocked and unattended, and be sure that your home is secure when getting ready for work. If you see Perkins, call 9-1-1. Posted in: Crime Stoppers, Media Release, Put A Name with This Face, Reward, WANTED. Tagged: Brink. 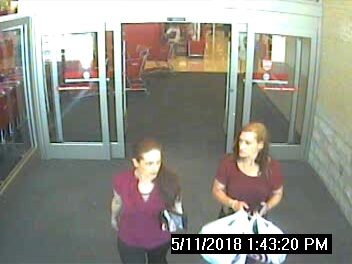 Franklin Police are working to identify these suspects, wanted for using a stolen credit card to rack up more than $1,000 in fraudulent charges at the Columbia Avenue Target on May 11. Investigators are hopeful that this recently obtained surveillance photo will help lead to an identification and arrest.